"Here in Louisiana, there's nothing better than this classic during crawfish season. This recipe is easy and can be substituted with shrimp when crawfish are out of season. Even better when served with hot garlic French bread! Start cooking the rice first since this is a quick and easy dish." Combine the rice and 6 cups water in a saucepan, and bring to a boil. Cover, and reduce heat to low. Simmer for 15 to 20 minutes, until rice is tender and water has been absorbed. While the rice is cooking, melt the butter in a large skillet over medium heat. Add the onion, and saute until transparent. Stir in the garlic, and cook for a minute. Stir in the flour until well blended. Gradually stir in the tomato sauce and remaining 1 cup water, then add the crawfish tails and bring to a simmer. Add the green onions and season with salt, pepper, and Cajun seasoning. Simmer for 5 to 10 minutes over low heat, until the crawfish is cooked but not tough. Serve over hot cooked rice. 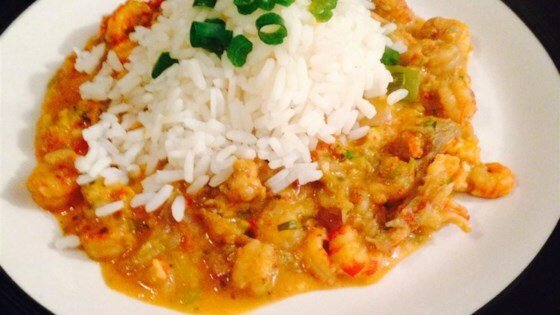 An authentic Louisiana recipe for spicy Cajun stew. For Kerms, the water is supposed to be for the rice. Not the etouffee. I think that was your mistake. Super easy! I am from Louisiana and agree with other reviews...etouffee should not contain canned soups! My entire family enjoys this recipe! Had to rate this a 5 to offset Kern's review. The 3 cups of water are to cook the rice in, not to add to the Etouffee.